Woohoo! I got my alcohol-activated paint in the mail and gave it a try. While it’s more expensive than the other solution I offered with the latex gloves, I recommend this method if you can get hold of the stuff. You put it on, it dries really fast, and then it doesn’t come off for anything short of 99% isopropyl alcohol. 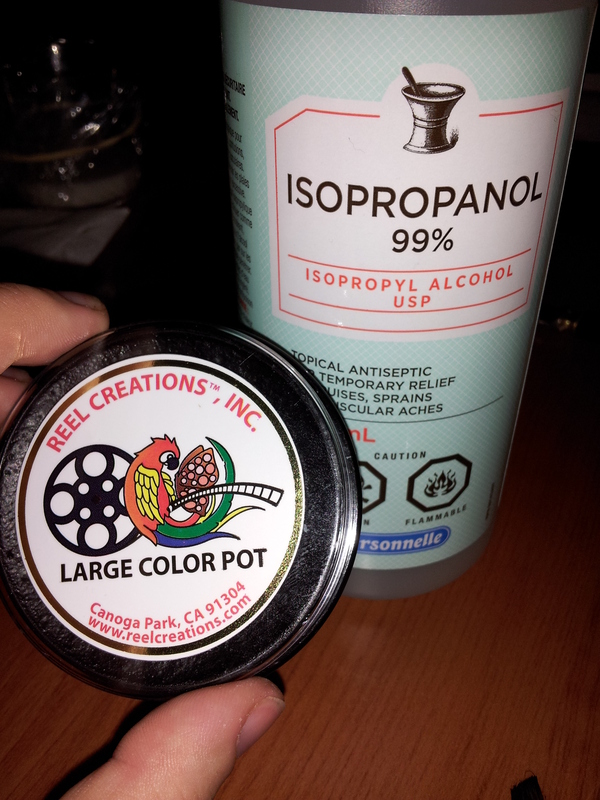 I initially ordered it through Reel Creations but given that I live in Montreal, the shipping was going to be almost twice what the actual colour pot was worth! So I sent them an email asking if there were any distributors closer to where I live so that I wouldn’t have to pay crazy ridiculous shipping. They were exceedingly helpful and understanding and in a few days they got back to me with a distributor in Toronto: The Face Station. If you’re in Canada looking to buy unusual makeup and theatre stuff, I highly recommend these folks. They work alongside an actual theatre and special effects school so they’re able to give you tips and such on how to use their products. The colour pot didn’t come with any instructions but instead of pestering the Station, I just talked to my friend who recommended the stuff to me in the first place. It’s ridiculously easy to use. So let’s get down to business and show you how it’s done! 99% isopropyl alcohol. The 70% won’t work so don’t even try that. You’ll need this and a sponge. Seriously. That’s it. Remember to do a test spot in case you’re allergic to something in it. You never know! Better to be safe than sorry. 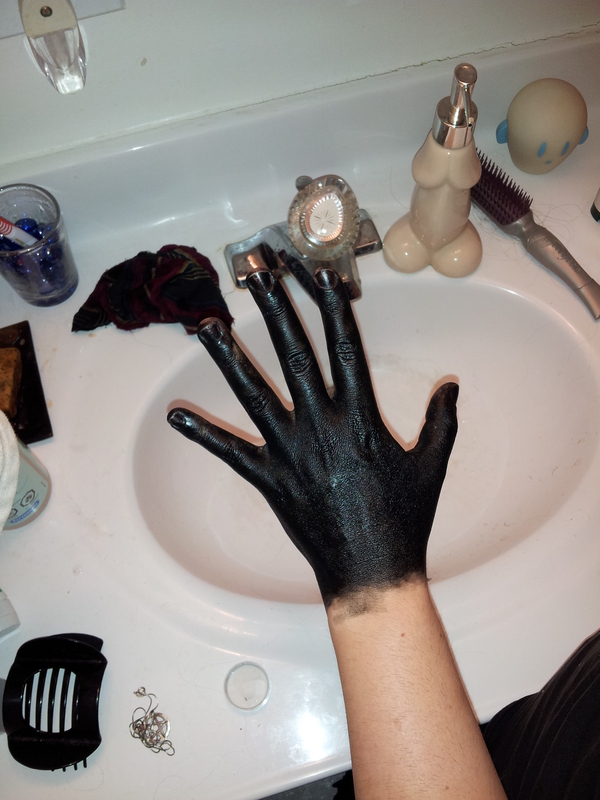 I left it alone for about an hour and it didn’t react at all so I proceeded to coat my hand. Oooh look at that colour! Perfect. I kept a little container nearby with some alcohol poured into it which I kept dipping my little makeup sponge and rubbing it onto the paint before transferring it onto my hand. Now, here’s the science behind it: The paint itself remains inert until you mix it with alcohol. Once the alcohol evaporates/dries (and the 99% stuff dries crazy-fast!) it becomes inert again. So, it doesn’t matter if you get alcohol in the paint pot itself, it’ll just go back to being inert when the alcohol has gone away. No worries about waste which is a godsend given the cost. 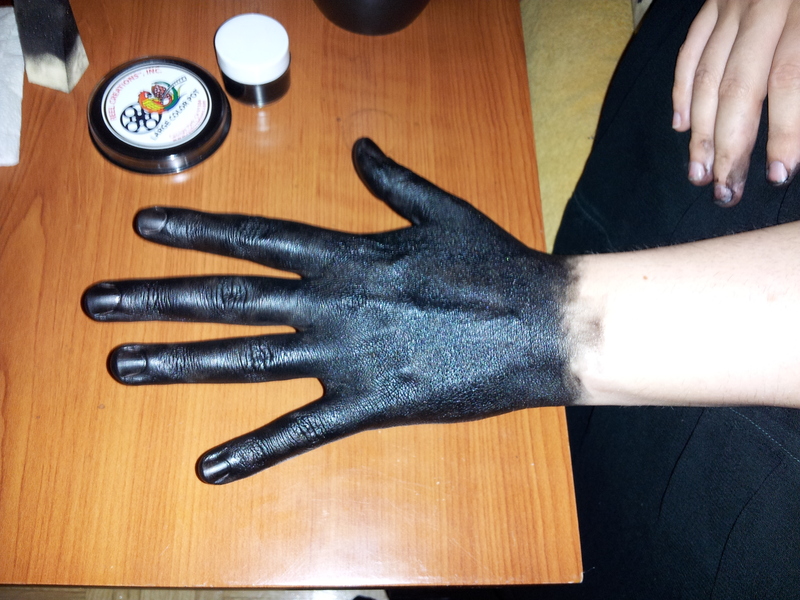 The idea is to activate the paint and transfer it to your skin so that when it goes back to being inert, it’s inert ON you. I applied it a bit at a time in a few layers just to get a feel for how it behaved. It dried fast enough that, as I sponged round and round my hand, the thumb was dry and ready for another coat by the time I got to my pinky. THIS is why I wanted alcohol activated paint. 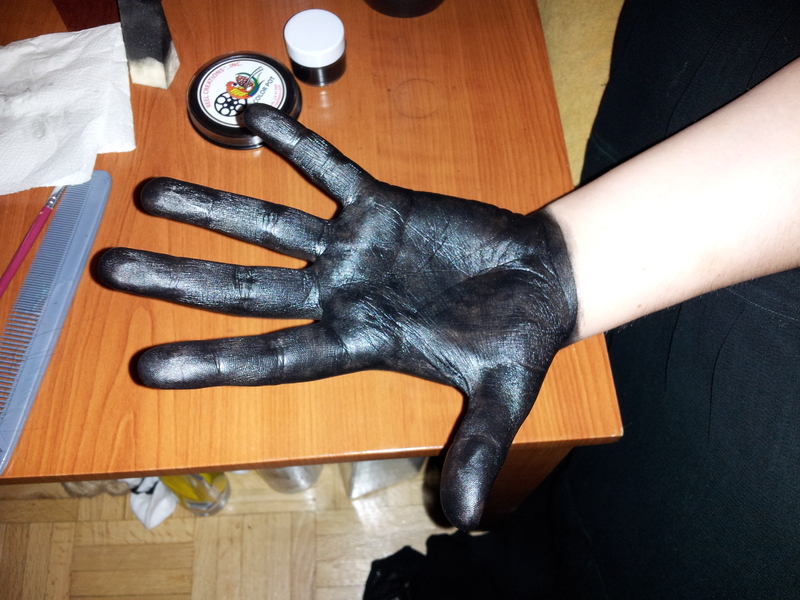 The palms have to be black and they have to not smudge that blackness all over everything I touch. I’m happy to say that within the hour I was operating my smartphone and typing away on my computer and styling my wife’s costume wig with no smudging or smearing. You might need to touch up the fingertips a few times a day depending on how much use your hands are getting but remember that you shed skin all day as you move around and touch things. (I know, I know: “Dude! Gross!” Sorry, I hope you weren’t eating.) The paint is only on that very top layer. Now it’s time to take it off! I splashed a little container of alcohol on it to see what it would do. It makes fun patterns. Where the alcohol didn’t go, though, stays put. Soap and water does nothing. After playing with the alcohol for a bit, I tried. Nothing further came off until I put on more alcohol. You’ll want some cotton pads/balls or perhaps a roll of paper towel or toilet tissue to wipe the paint off once you’ve re-activated it with the alcohol. 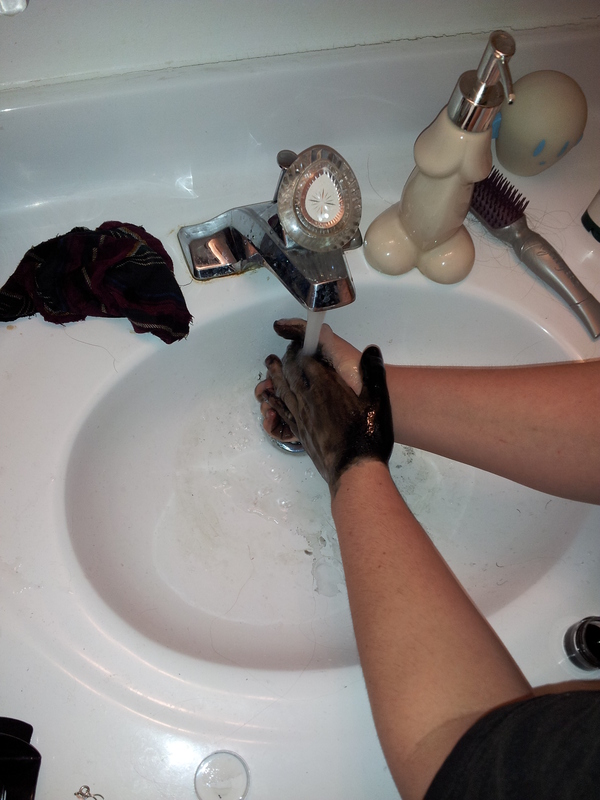 Water might help rinse a little of it off once you’ve put the isopropyl on but wiping it is really the best way. And about six minutes later, it’s gone! What a fun experiment! Remember that rubbing alcohol is really harsh on your skin and take the time to be nice to it afterward. 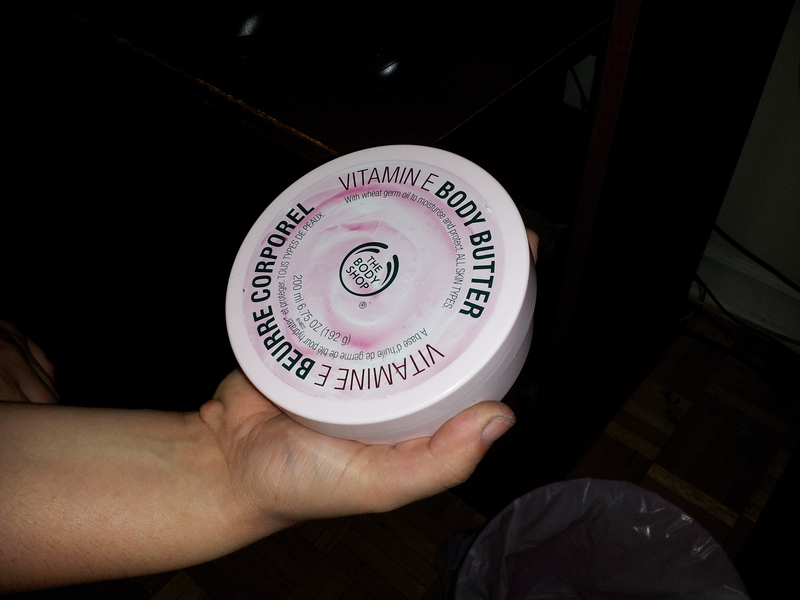 I rub some vitamin E cream where I had the paint as my apology to my body for doing weird crap to it. So that was 16.99 CAD well spent I feel. They have quite a few colours so give them a shot if you want body paint that stays put all day. Yes, it was so disappointing since they only have the palettes. Ahh, yes, you are correct! I checked and they no longer sell the single colour pots. Boo! 😦 I’ll have to order my next one from the manufacturer. That’s going to cost a lot in shipping. Phooey. Hey there. This is a great article, you’ve given me hope I can pull off my own cosplay without turning everything grey. So here’s my question. I got the ink, and I found a place to buy the alcohol. But I don’t know how much to buy. How much did you end up using? I only need to paint my face, arms, and shoulders—I’m playing Equius Zahhak from Homestuck, and I will be wearing a tank top. Do you know how much I should buy for application and subsequent removal? Also, how many coats did you do on your hand? I need to know how early I should get up before my event, heh. Also, how much skin can you paint on one container? It’s totally possible! Just takes a few tricks. For my Drow cosplay, I covered my face from hairline to collar-bones and out to my shoulders (so that even if the neck of my shirt shifts as I move around, still you only see black skin), and from fingertips to elbows (because for loose sleeves, if you raise your arms, the sleeves slide up and expose more skin.) I have done this costume roughly ten times and the colour pot I purchased is about 2/3 used up. That includes touch-ups throughout the events I dressed up for. (High-traffic areas like your palms will need the occasional touch-up through the day.) The colour pot I bought was the LARGE. So the 2 1/2″ one. I estimate that you could cover the entire body 2 to 3 times depending on your size and how fast you shed skin, before the colour pot is completely gone. I bought 500mL of 99% Isopropanol (Isopropyl alcohol) and I have about 1/10th left. You should need no more than that for how much you want to cover. You could definitely get away with half that much and have some to spare. Do keep in mind that it evaporates quickly so keep the cap on when it’s not in use and don’t pour it into a cup or bowl to make use of it. Take it straight from the bottle each time to minimize loss from evaporation. Initially, it took me about 2 or 3 coats when I was getting used to working with the paint but after I got accustomed to getting in and out of costume it only took me one coat plus a few touch-ups here and there. I recommend being generous with the amount of alcohol on your sponge to begin with and if it is too drippy/runny/thin, continue wiping the sponge against the paint puck until it acquires the opaque shade you want. You can still manipulate it once it is on the skin as it becomes wet again when you touch it with the alcohol so feel free to experiment. I also recommend a “dress rehearsal” a day before the actual event so you can time how long it took you. Initially, it took me 3 hours to get into costume. Now it takes me a little less than one so if you fancy sleeping a decent amount before the event, it’s worth it to practice a bit beforehand. I hope this answers your question? Feel free to poke more if you need more info and by all means send pics of your cosplay! That answers pretty much everything I wanted to know, thank you so much! This is my first time cosplaying anything, ever. The last time I dressed up was as a teenager with a rubber gorilla mask. I’m 29 now. I’ve never made a costume before. You have no idea how valuable this blog entry and your other one have been to me since I’m a total n00b. It’s pretty daunting at first. Thank you so much for posting this stuff. It seems that either the grey isn’t as opaque as the black, or I just don’t have the hang of this yet. I was worried about running out of ink, but from what you said that won’t be an issue. Once I get my horns done I’m going to paint myself to see how long it takes. So far, I’ve done a couple of tests. I painted a patch on my arm and showered, and it was fine. I also applied moisturizer and then deoderant to a patch (I’m going to have to paint my armpits) and it was fine. The only thing that seemed to take it off was scratching at it intentionally with my nails. So wait. You’re telling me you were carrying around a container of alcohol and sponges the whole time? I might do that if I can find a little bottle to put the alcohol in. it’s not a bad idea. And I’m planning to work from the top down. 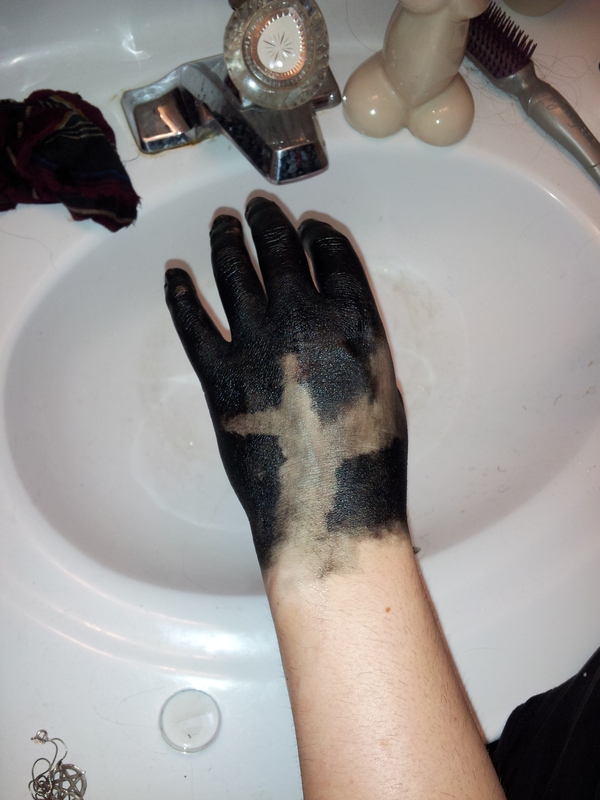 That way, If I drip alcohol, it won’t ruin paint on my arms or something. What kind of a sponge did you use? Like, a dish sponge? A makeup sponge? Also, did you eat or drink? I’m going to be at an event with a lot of both. I definitely don’t want the stuff coming off my face, but it’s an outdoor event so patching in a portopotty might be awkward. I’ll definitely have some pics at the event that I’ll post! Yes indeed! I have a small makeup kit that I carry with me to conventions. It fits easily in my pocket. In fact, I’ll write an article and show you exactly what’s in my kit and what travel bottles are and aren’t good for carrying isopropanol. It’s more runny than water (if you can imagine that) and tends to make more escape attempts. Ha! I use a makeup sponge. A cheap one will do. Dollar stores carry packs of them for a buck usually. At the conventions and Halloween parties, I eat, drink, take naps, pick up and handle merchandise without worrying about smudging or having to visit the bathroom 15 times a day just to touch up my paint. I’ll post a link here to the travel kit article once I’m finished it. Thanks for asking these questions! Otherwise I’d never have realized that information was lacking. Alright! Here we are: my convention kit. Hope this helps! Wow, I’m so sorry. I completely forgot to get back to you. It’s been well over a month, you helped me a lot, and I just completely forgot to write this up. I’m sorry. Where should I send pictures? Anyway. The costume went over relatively well, especially considering it was my first try at making any costume ever. I’ll tell you my experience about it, I’ll leave out the not-paint-related bits. It seems the grey Reel Creations paint is a lot different than the black. I admit that I didn’t follow all your advice and didn’t do a full “dress rehearsal” because my gut told me I wouldn’t have enough paint, and I was right. When the day rolled around, I set up in my friend’s bathroom and got to painting. Sponges, alcohol, paper towels, set up a fan at the door and opened the window to create an air current to get rid of the fumes. I got one of those half-yard or so wood paint stirrers from Home Depot and hot glued a couple of makeup sponges to the end to make a tool for the backs of my shoulders. I even shaved my arms for this. Fast-forward two hours and I run out of paint. 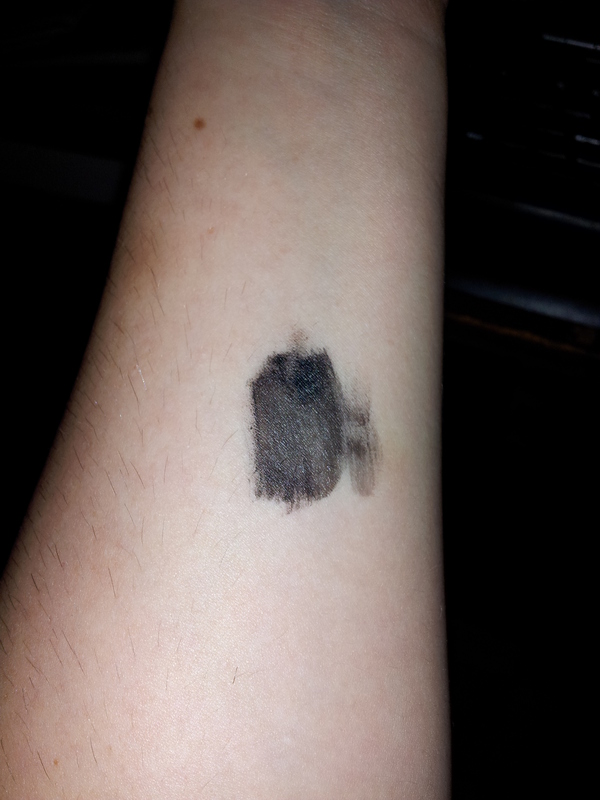 My face was the first thing to get covered so it looked pretty good, but my arms were patchy. I prioritized the front of my body, so the backs of my shoulders were all streaky, and I never got to use that back tool I made. I even went to the trouble of making a portable kit on your suggestion, but I ended up not bringing it, since without more paint it was pointless. So basically, I got enough paint to do my face a couple times and one arm ( for practice) and then both arms and my head on the final run. The black apparently has far better coverage judging by how little you used, or I’m just somehow really bad at this. However, the thing is, no one cared about my paint except me. Everyone I met at the renaissance fair appreciated that I went to the effort of trying, and I actually looked presentable from the front. Lots of people wanted pictures, even non-Homestuck fans. Yes, I dressed up as a Homestuck troll at a renaissance fair. Due to my work, I doubt I’ll have time to go to any cons, and I really wanted to dress up as Equius, so I decided to be completely out of place, and it was awesome. People were coming up to give me hugs and take pictures with me or of me, I felt like celebrity. So, despite running out of paint, everything worked out. 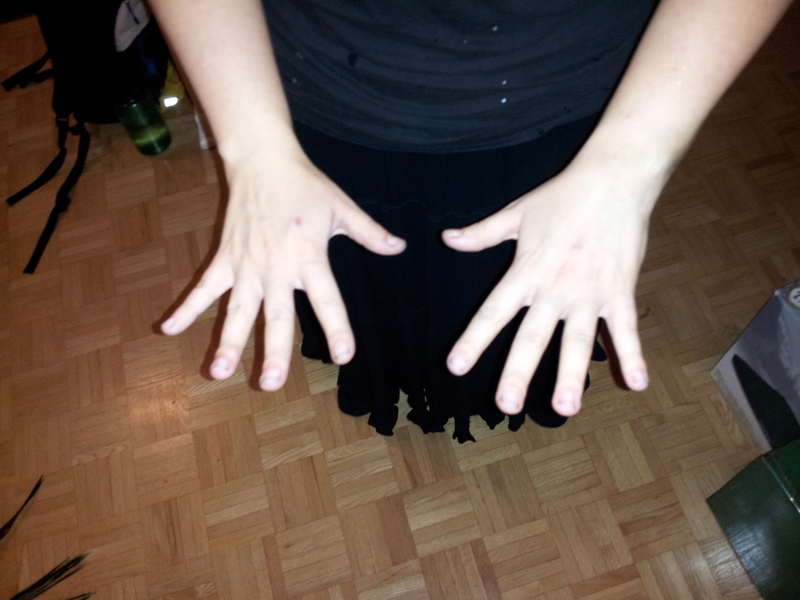 By the end of the day, my elbows were cracking, I had no paint around my mouth (probably all the mead), my hands were almost completely worn off. Next time, I buy two cakes and use arm sleeves. Also, the alcohol was a mission to get. Long story short, I drove to a few places in town, and none of the bigger chain places had it or offered to order it. I ended up placing an order online, but at the last minute I found a place about 30 minutes from me that had it, so I bought it there. I paid more, but I was on a timetable. And I wouldn’t have gotten this far without your blog and all the great advice you gave me. I really do appreciate all the stuff you’ve written and your thorough answers to my questions. Thanks again, and sorry it slipped my mind. You have helped initiate me to the way of cosplay. Ah that should work just fine 🙂 I usually can’t get my hands on anything that pure without going to special effort. This has been so helpful for my first foray into AA makeup! How long can you actually safely keep the stuff on? For my test runs the longest I’ve had it on was three hours, and I see that you’ve slept in it before, but my events would involve anywhere from 36 – 72 hours in the stuff. Do you have any recommendations or precautions for wearing it for such an extended period of time? The precautions on the instructions recommend not to put the paint near the eyes. I think this is sensible. I left most of the eye socket uncovered by the AA paint and simply filled it in with Merhon Starblend watercolour. You could also use mascara or anything else meant to go around the eyes. Whenever I showered, I looked like a reverse raccoon. Face all black with white circles around my eyes. It was funny! So yes, 3 days and no complaints from my notoriously grouchy skin. You’ll probably be just fine.